Diego Vivero and Bijoux. Photo © Sportfot. Wellington, FL — February 21, 2018 — The seventh week of the 2018 Winter Equestrian Festival (WEF) began on Wednesday, February 21, and opening up competition with a win was Diego Vivero of Ecuador on Bijoux in the $35,000 Douglas Elliman Real Estate 1.45m Jumpers CSI 5*. There were 67 entries in the final class of the day in the International Arena, and they competed over a course designed by Anthony D’Ambrosio of Red Hook, NY. In the power and speed format, the fastest over the second phase of the course was Vivero on Bijoux, a 12-year-old KWPN mare by Cartani x Athletico owned by Javier Estrada, in 30.35 seconds. Second place went to Andy Kocher (USA) and Kahlua, owned by Top Line Sporthorse International LLC, who were just behind in 30.74 seconds, while McLain Ward (USA) and Cerise, owned by Sagamore Farms, were third in 30.92 seconds. Diego Vivero and Bijoux. Photo Credit ©AnneGittinsPhotography. Wellington, FL – December 27, 2017 – The ESP Holiday III competition saw a win for Diego Vivero of Wellington, FL aboard Bijoux in the $25,000 Dover Saddlery Grand Prix. Second place was captured by Todd Minikus of Lake Worth, FL piloting Carlo, owned by North Face Farm, stopping jump-off timers in 40.753 seconds. Third place was awarded to Ian Millar and Future Adventures’ Vittorio 8 after completing their fast track round in 41.807 seconds. Vivero and his mount raced around the day’s course designed by Andy Christianson, Jr. of Wellington, FL and completed the jump-off in 40.018 seconds. Four of the original 22 entries moved forward to contest the short course. The $10,000 Dover Saddlery Open Welcome Stake marked another win for Emanuel Andrade of Wellington, FL, riding his own Garinco van de Lijnsaerd. The pair flew over the jump-off track in 42.397 seconds, ahead of Pablo Mejia of Loxahatchee, FL and his own RL Queen Mary, who stopped timers in 43.695 seconds to achieve second place. The jump-off welcomed back only three horse-and-rider combinations, with Alejandro Karolyi rounding out that top three aboard Bo Hopson’s VDL Elliot, finishing in 42.048 seconds with four faults. Kelly Bauernschmindt of Bratenahl, OH rode to victory aboard Belle Bleu S, owned by Bauernschmindt, in the $1,500 NAL Child/Adult Jumper Classic after stopping the jump-off timers in 39.595 seconds with four added faults. Robert Reyers of Wellington, FL and his own Ignore Van Orshof took second place with a time of 45.289 seconds and four faults. Mariana Herrera of Loxahatchee, FL and her own Da Vinci earned third place after a four-fault jump-off round and a time of 49.473 seconds. The $1,500 Low Children/Adult Jumper Classic saw Joshua Baird of St. Charles, IL and Pony Lane Farm’s Licapo take first place with a jump-off time of 40.961 seconds, while Claire Sieuzac of New York, NY and her own Zandora De Shalimar finished in second place with a first round time of 70.956 seconds and one fault. Joshua Baird also collected third place with his own Lolipop S, after finishing with four faults and a time of 60.095 seconds in the first round. Tracy Harris of Wellington, FL and Une Etoile de L’ Eclypse, owned by Harkopp Farm, championed the $2,500 Accuhorsemat M&S Child/Adult Classic after completing their jump-off round in 43.136 seconds to best the class. Lexi Maounis of Greenwich, CT and Roos, owned by Maounis, collected second place with a time of 45.427 seconds. Isabelle Wagener achieved third place aboard her own Balougris SL Z, rounding out the top three with a time of 46.665 seconds. The $5,000 1.35m Stake was won by Pablo Mejia of Loxahatchee, FL and RL Monaco, owned by Mejia, after crossing through jump-off timers in 37.409 seconds. Emanuel Andrade of Wellington, FL and his own Anastasia Du Park earned second place with a time of 39.063 seconds. Andrade also finished in third place with Tupac Van de Vrombautshoeve Z after contesting the course in 39.468 seconds. Sarah Sturges of Sunbury, OH was awarded champion of the USHJA 2’6″ Hunter Division. Her winning mount was Spot On, owned by Haylee Jerkins. Reserve champion was presented to Kelly Mullen of Franklin, TN and Valentino, owned by Warioto Farms, LLC. Cecilia Perry of North Venice, FL and Misty, owned by Montoga, Inc., were champions of the Small Pony Hunter Division. Reserve champion was also awarded to Perry, riding Fielding Stichman’s Sparkle. The Performance Hunter 3’3″ & 3’6″ Division champion was awarded to Kelly Mullen of Franklin, TN riding FortuNY, owned by Warioto Farms, LLC. Reserve champion was awarded to Melissadre Lincourt of Montreal, QB and Brigitte Leroux’s Sugar Ray. The USHJA Hunter 2′, 2’3″ & 2′ Division was won by Kelly Mullen of Franklin, TN and Happy, owned by Warioto Farms Inc. David Laks of Bedford, NY and Saint Laurent, owned by Elite Equines LLC, captured reserve champion honors. Laurie Stevens of Boca Raton, FL and her own Santiago finished atop the division in the Low Adult Hunter Division. Blythe Goguen of Lexington, KY collected reserve champion with Zjappoo Sow, owned by Kelly Goguen. West Palm Beach, FL (January 17, 2017) – Back to back Grand Prix classes headlined Week 2 of the 2017 Palm Beach Series, where challenging but practical courses in a relaxed atmosphere welcomed competitors from January 11-15 at Jim Brandon Equestrian Center. Weekly champions were also named in the Junior/Amateur Owner Jumpers, Children’s Jumper, Adult Jumper, and Pony Hunter divisions, and accepted a variety of prizes from the EQUO Stylish Rider Award to horse bonnets and customized Palm Beach Series belts. Presented by The Ridge at Wellington, the Palm Beach Series features exceptional prize money, world class footing and jump materials, and a utopian ambiance, all intended to nurture developing horses and riders. Competition kicked off Wednesday in the multiple all-weather arenas at Jim Brandon with Rings 1 & 2 hosting everything from .65m to the Grand Prix, and ran through Friday and continued all USEF Level 2 Jumpers and Outreach. 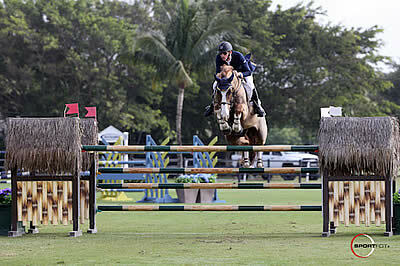 Ecuador’s Diego Vivero and Bijoux came out on top in the first $15,000 1.40m Grand Prix on Friday. A speedy, precise round with the talented Bijoux gave him a double clear and the winning jump off time of 31.003, while Week 1’s Grand Prix winner, Luis Fernando Larrazabal, piloted G&C Close Up to second on a 32.563. Vivero also placed third with his second mount, Reglisse Top, with a 34.578. For Saturday’s 1.45m Grand Prix, presented by Dave Corbin and Jim Corbin of Illustrated Properties, the jumps were set a bit higher, and the course a little more technical. At midday, international Grand Prix rider Debbie Stephens and Everest held the lead with an exceptionally quick jump off time of 29.311. Fast as the pair was, they weren’t fast enough as another highly decorated rider, Amy Momrow, romped around the course with Baldino du’ Rovet, riding a double clear effort and slipping in just under Stephens’ time with a 27.525. Stephens, whose ride was impressive on its own, was also awarded the EQUO Stylish Rider Award for her efficient round and elegant turn out with Everest. Presented by the sport and fashion equestrian line EQUO, Stephens was presented with a “Champagne and Horses” show shirt and a bottle of Vueve Cliquot by The Ridge’s founder, Palm Beach Series organizer and US Olympian Nona Garson. Of her mount, Everest, Stephens noted that she purchased Everest as a 7-year-old, and felt it was time to move him to the next level. The 2017 Palm Beach Series includes 13 weeks of hunter, jumper, dressage, and equitation competition, including a diverse offering of divisions and classes, National, International, and Pony USHJA Hunter Derbies, weekly 1.40-1.45m Grand Prix classes, USEF Equitation Tuesdays hosted at The Ridge at Wellington, and the exceptional venues and all natural surfaces on the Turf Tour. 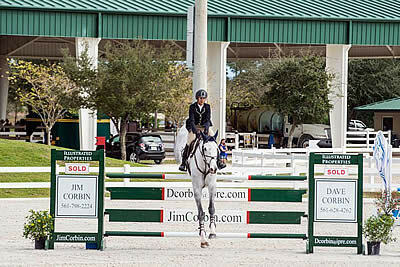 Hosted at the Jim Brandon Equestrian Center, just two miles from Wellington’s center, the Palm Beach Series will also offer seasonal stabling packages on the show grounds, which include a covered arena, multiple all weather arenas, permanent barns, and a variety of amenities for horses and riders.